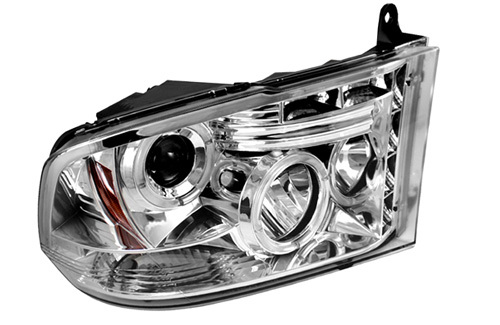 IPCW Chrome Projector Headlights 09-18 DODGE RAM IPCW Projector Chrome Clear Lens Headlights 09-18 DODGE RAM, Projector Chrome Clear Lens Headlights 09-18 DODGE RAM, Projector Chrome Clear Headlights 09-18 DODGE RAM, Clear Headlights 09-18 DODGE RAM, Chrome Headlights 09-18 DODGE RAM, Chrome Headlights, [IPCW CWS-423C2 Head Lights] - $389.95 : 3rd Strike Performance, Your Source for Late Model MOPAR Performance Parts and Accessories! Give your Dodge Ram a great new look with a set of custom projector headlights from In Pro Car Wear. Each set of headlights is custom made to fit your specific year model and work with existing wiring. This makes for a quick, easy installation by simply removing your old lights and installing this premium upgrade. Each light is sealed to resist moisture and other road elements. Projector headlights provide a more modern look and feel and project a brighter, clearer spectrum of light onto the road in front of you. Also, you'll get the added benefit of a more focused light to keep the things that matter in plain view. Each set is ready to go and will look great on your Ram truck. Upgrade your lighting today with a brand you can trust.